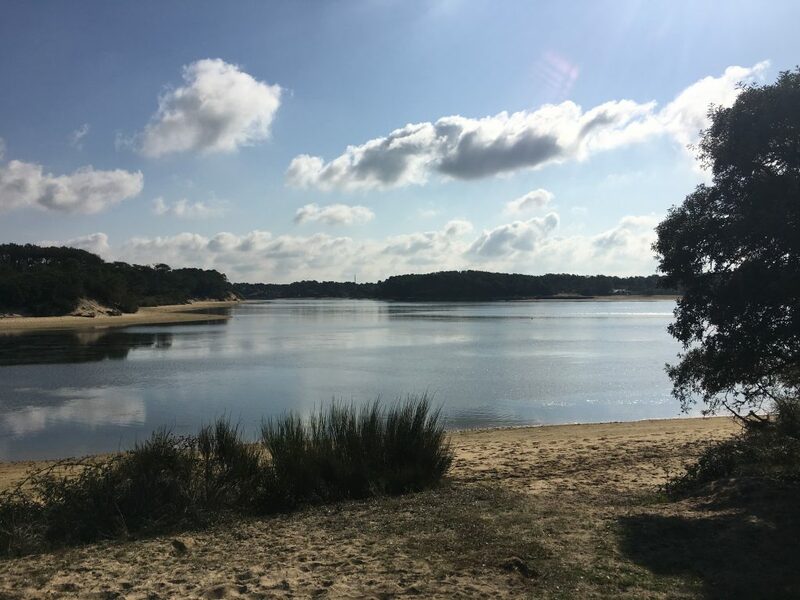 Further south, still enveloped by the pine forests of the Landes region of France, is a purpose built resort with the rather long name of Vieux-Boucau-Les-Bains. 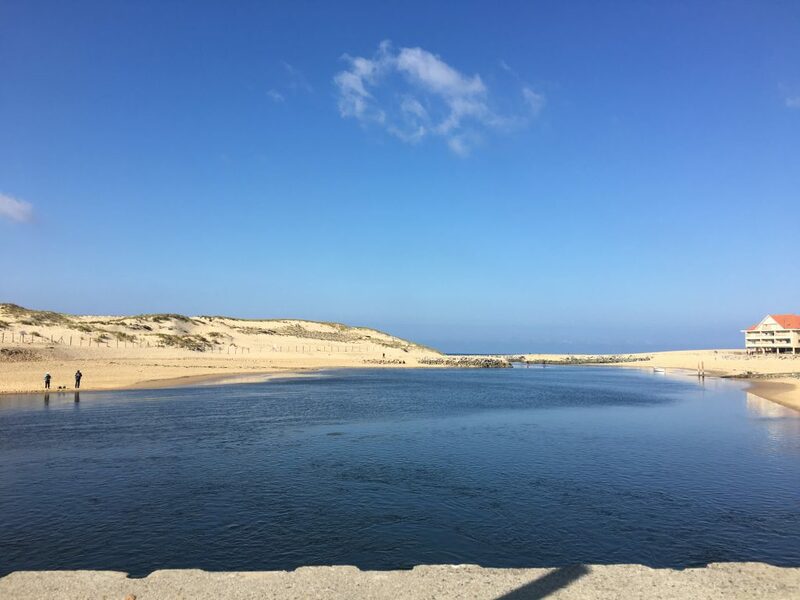 Part of it’s attraction is an artificially created lagoon which lets in sea water at high tide and has sluice gates to control the exit of water; this gives people the option of the surf beaches of the Atlantic or the calmer waters of the lagoon. Even though we had set off early we still found it incredibly busy when we arrived, it was Saturday and very sunny after all. The two aires were near to capacity and there was a constant flow of people arriving, we queued up behind a couple of other vans to get in and I went to look for possible parking spots while Paul helped them to get through the airlock style barriers (the trick was to get close to the ticket machine as the front barrier wouldn’t lift unless your van was close enough to the sensor). We wedged ourselves into a spot in the sun on the southern side of the lagoon and hooked up to the electricity, at €7 a night for a pitch plus electricity within a stone’s throw of the lagoon, it didn’t seem like bad value. We had a quick stroll around the end of the lagoon watching the fisherman who were lined along the outflow from the lagoon. We decided that the calm waters were too good an opportunity to miss and we should get the Kayak out and enjoy a spot of paddling and fishing. It was easy to launch the kayak from the shore close to the aire and we started with a gentle paddle around the lagoon gliding over long strands of green weed waving in the gentle currents of the lagoon. We could see fish jumping as we approached, darting out from their shelter in the weed, but despite best endeavours weed was all we caught. We circled the lagoon again, closer to the island in it’s centre this time, and pulled up a couple of times to explore it’s beaches. Here we paddled in the shallower waters looking at all of the life, hordes of hermit crabs in their stolen shells crawled across the sands, starfish nestled in the weed and small fish were well camouflaged against the sand. The waters of the lagoon were too weedy, and the bottom too muddy to tempt us in for a proper swim. We gathered a few clams from under the sand to make ourselves a starter for dinner, but they were too gritty even after a few hours being purged and the juices in the pan were grey with silt. Luckily we had cooked up some pork and roasted veg for a main course which kept hunger at bay.